While there are dozens of issues and violations in the joint use world, there are a few we see so often we consider them problems of interest: repeat offenses to which no utility pole owner is immune. This installment, the eighth in an ongoing series, we discuss dealing with the old and the forgotten—abandoned utility poles. Just like humans, animals and the gallon of milk in your fridge, utility poles age—and have an expiration date. Though typical life expectancy varies based on material type, manufacturing process, preservatives used and even the installed location of the pole, most experts agree that a typical wood utility pole will last about 30 to 40 years. Sooner or later, the pole owner must retire a pole due to age or diminished structural integrity. Unfortunately, when the time comes, sometimes an old pole is left standing next to its younger replacement. This marks the start of a problem. Often referred to as “double wood," the practice of leaving old poles standing when they should be removed is one of the more maligned joint use issues, both from an industry standpoint and the perspective of the public. 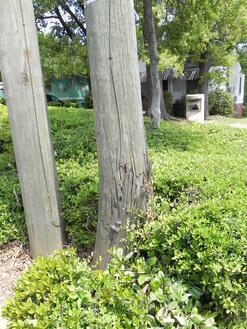 We have discussed it before, but it bears repeating—double wood can mean double trouble for utility pole owners. While the best advice is to simply remove poles as they are decommissioned, we all know that transfer backlogs do occur. With the idea of “no pole left behind” in mind however, there are a few things pole owners can do to cut down on double poles. First, conducting a utility pole inspection helps pole owners determine where old and unneeded poles may exist, reducing unknowns and offering a thorough look at equipment in general. This inspection can answer a lot of questions about assets in the field and can include strength testing, survey and recording of attaching companies, identification of NESC violations, rot testing and precise mapping of poles via GPS. Secondly, using an intuitive, online joint use management system can also keep owners in the know, offering easy access to all kinds of field inventory data. Systems like this also provide clear avenues of communication with attachers and internal maintenance crews so that when double wood is found, it can be remedied quickly. Safety, safety, safety. Abandoned poles are generally those that have been previously retired for one reason or another—age, structural issues or damage. In their weakened state, these assets pose a danger and a significant liability risk for pole owners. Left in place, these poles can fall or collapse, causing potential bodily harm and property damage. They also have the tendency to damage fully functioning, adjacent poles on their way to the ground—another cost and liability for pole owners. Perhaps less urgently, but nonetheless importantly, double wood or unused poles are also an eyesore that property owners do not view kindly. So, how is your pole transfer situation? Are you leaving decommissioned poles in the field? If you are unsure of the state of your assets across the landscape, a utility pole inspection coupled with ongoing joint use management can help answer the question—and turn double pole issues into singular safety successes.